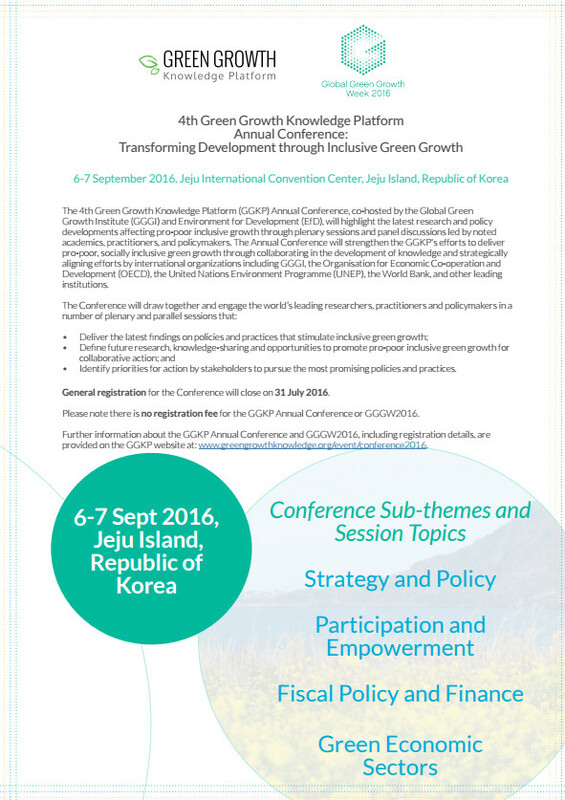 The Fourth Green Growth Knowledge Platform (GGKP) Annual Conference took place on the theme of “Transforming Development through Inclusive Green Growth” during 6-7 September 2016 at the International Convention Center on Jeju Island, Republic of Korea. While 2015 represented a landmark year for achieving ambitious government commitments, resulting in adoption of the Sustainable Development Goals (SGDs), the Paris Climate Agreement, and the Addis Ababa Action Agenda, the challenge has now shifted to implementation and turning commitments into action. 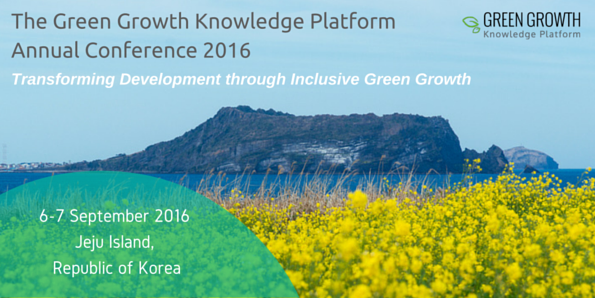 In order to scale-up inclusive green growth solutions that respond to these commitments, the Fourth GGKP Annual Conference drew together leading global experts, academics, and practitioners to identify, discuss, and debate the latest research and policy solutions. In particular, the discussions explored how to ensure the pursuit of green growth is equitable and inclusive. 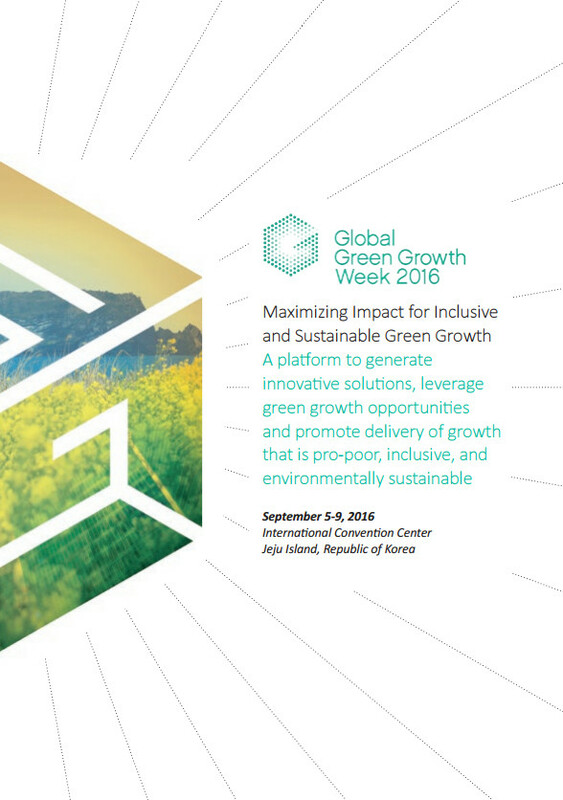 This year’s conference was hosted by the Global Green Growth Institute (GGGI) and formed a major part of the Global Green Growth Week 2016 (#GGGWeek2016) to be held 5-9 September 2016. For the Annual Conference, GGGI partnered with the global university network Environment for Development (EfD) to ensure a wide range of views and research are represented at the event. The GGKP, founded by GGGI, the OECD, UNEP, and the World Bank, is the world’s largest global partnership of organizations and experts committed to collaboratively generating, managing, and sharing green growth knowledge and data to mobilize a sustainable future. Build practitioner skills and define future research, knowledge-sharing, and collaboration opportunities to promote pro-poor inclusive green growth. Paper Presenter: Ms. Soazic Elise Wang Sonne, PhD Fellow, United Nations University and Maastricht University, Netherlands, Understanding the Determinants of Clean Fuel Adoption in Senegal: Do Informal Institutions and Women's Intra-Household Bargaining Power Matter? Country Presenter: Dr. Haileselassie Medhin, Director, Environment and Climate Research Center and the Ethiopia Development Research Institute, Ethiopia, Can Ethiopia's Modernization Be Green? Information on hotels, transportation and visas can be found on the GGGWeek2016 website here. Follow the GGKP on Twitter for updates and live coverage of the Annual Conference.